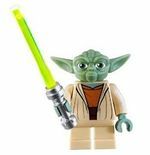 Yoda is a minifigure based on the Star Wars character of the same name, introduced in 2002. He has had six different variations over the years in eight different sets and is a playable character in all four LEGO Star Wars video games due to him being one of the few Jedi to survive the Great Jedi Purge. To date, Yoda has appeared in three different forms - one for sets based on scenes from the main Star Wars movies, another from sets based on The Clone Wars, and the third an exclusive Christmas variation. His first variation came about in 2002 with the release of Episode II: Attack of the Clones sets. Yoda appeared in 7103 Jedi Duel armed with a green-bladed lightsaber with a chrome silver hilt. This variation had a light brown torso piece with some darker brown printing on it to better represent Yoda's clothing, and green hands. The leg piece is also light brown, and is a shorter version of the standard Minifigure leg. Yoda's head piece was specifically designed for this Minifigure, having been shaped to a likeness of the Jedi Master's head. The piece is naturally the same colour green as the hands. This Minifigure made its next appearance two years later, this time in a set from the Original Trilogy 4502 X-wing Fighter. Yoda once again came with a green-bladed lightsaber, but with a bar piece (the same piece used as a lightsaber blade) in dark brown. This piece is used to represent the gimer stick that Yoda is known to usually walk with. The last appearance of this version of Yoda so far was in 2005, in the Episode III: Revenge of the Sith subtheme. This Yoda also had his walking stick as an accessory, but did not have a lightsaber. He is also sometimes seen on a hovering chair. Yoda's original appearance, front and back. Yoda's second variant is currently exclusive to the 2009 8018 Armored Assault Tank (AAT) and 2011 7964 Republic Frigate . This variant retains the same colour and type of leg piece and hands, but his torso piece differs in its printing. The darker brown printing representing Yoda's inner tunic is more predominant in this variant, and some green also appears at the top of the torso piece to show a neck. This variant also has a completely new headpiece, with a larger head and ears. The head piece is also made of a rubbery material, and usually turns much more easily than a normal Minifigure head. The head piece also has printed eyes, being consistent with the design of giving Minifigures from The Clone Wars subtheme a more "cartoon-like feel". In the set this variant appears in, a green-bladed lightsaber with a chrome silver hilt is included for Yoda. His third version is an exclusive version only found in one set, 7958 Star Wars Advent Calendar. 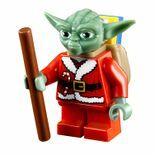 This version depicts Yoda wearing a red Santa-like suit. It has the same version of head as the Clone Wars version. Yoda appeared again in 2013, with a redesigned version. His torso is redesigned so he is now wearing a tan cloak with an orange shirt printed underneath and now has a printed hood on the back. He includes the same head as the Clone Wars version with printed eyes and hair. He has the same tan legs. This variant will be found in the 75002 AT-RT set and will be the first Yoda variant to wield a green bladed lightsaber. Yet to be released is a newly redesigned Prequel Trilogy Variant. This variant will feature a newly moulded headpiece  that sports the new Olive Green colour which will be used for his hands as well. He will have the same tan legs, but will have an all new redesigned torso again with a hood on the backside.This makes Yoda look more realistic to the movies. He will be featured in the 75017 Duel on Geonosis set. 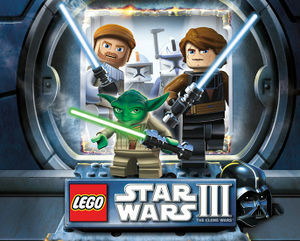 Yoda in the promotional image of LEGO Star Wars III: The Clone Wars. Yoda has appeared in all five LEGO Star Wars video games to date. Each of these appearances are based on the Yoda minifigure used in the sets based on the movies. 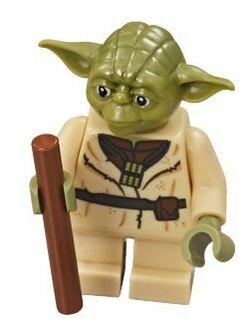 In these video games, Yoda walked with his cane, usually more slowly than other minifigures, but could attack by pulling out his green-bladed lightsaber, which would also result in him moving much faster, and performing acrobatics while attacking. In the first game, LEGO Star Wars: The Video Game, if Yoda jumped while walking with his cane, a hoverchair would appear and Yoda would sit on it. This way, Yoda moved at the same speed as other minifigures. The hoverchair did not make an appearance in either of the subsequent video games however. As well as his standard movie variant in LEGO Star Wars II and The Complete Saga, Yoda appeared in a ghost form, representing Yoda as a Force Ghost as he appeared to Luke Skywalker after he died. This variant had the same design and moves as the normal Yoda, however this Yoda was semi-transparent and coloured blue (as was his cane). The blade of his lightsaber was still green however. In the first video game, Yoda was able to use the Force, perform a double-jump, and crawl through chutes that only small minifigures could fit through. He retained these in the second and third games, along with gaining the ability to build objects. Yoda also appears in LEGO Star Wars III: The Clone Wars. He is based on his The Clone Wars variant, with animated eyes and longer ears. Yoda retains all of his abilities from the previous games, along with being able to cut through certain doors, perform lightsaber throws, and jumping up a set of two walls by plunging his lightsaber in one wall and jumping to the next. In this game, Yoda moves at the same speed as other characters. He only appeared in one level; Ambush. Yoda was a Jedi Master and leading member of the Jedi High Council for centuries. Later on he would become a Grand Master. In his time, Yoda had a hand in training a large number of Jedi to some extent, including Count Dooku, Mace Windu, Kit Fisto, and Luke Skywalker. Yoda participated in many battles during the Clone Wars, including the first battle on Geonosis, where he rescued the remaining Jedi in the Geonosis Arena along with several Clone Troopers in Republic Gunships. He then confronted his former Apprentice Count Dooku, now a Sith Lord in a lightsaber duel. Towards the end of the Clone Wars, Yoda was fighting on Kashyyyk, when Order 66 was given out to all Clone Troopers by Chancellor Palpatine, ordering them to eliminate any Jedi they saw. Yoda escaped from the planet with the help of the Wookiees including Chewbacca, and made his way to Coruscant. On the way, he met up with Obi-Wan Kenobi who had also managed to escape, and they proceeded to the Jedi Temple. They discovered that the Jedi had been massacred there, and that it was Obi-Wan's former Apprentice Anakin Skywalker, now the Sith Lord Darth Vader who had led the assault. Yoda ordered Obi-Wan to confront Vader while he attempted to neutralize Palpatine. Yoda made his way to now-Emperor Palpatine's office, knocking out his Royal Guards on the way. The two then entered into a duel, however Yoda was unable to defeat Palpatine and had to escape, then retreating to the remote planet of Dagobah. Three years after the events of the battle of Yavin, a Jedi-in-training named Luke Skywalker along with his droid R2-D2 crash-landed on Dagobah in an X-wing, after Luke received a message from his now-deceased Master, Obi-Wan Kenobi. Luke and R2 eventually came to find Yoda, and Luke underwent some Jedi training from him in the ways of the Force. It was during this training that Luke had a vision of his friends in pain in a city of clouds, and set off in an attempt to rescue them, despite Yoda urging him to remain on Dagobah and to complete his training. One year later, Luke returned to Dagobah to complete his training. However, in this time Yoda had grown sick, and knew that death was upon him. He informed Luke that his training was complete, and confirmed that Darth Vader was Luke's father after Vader told Luke during their duel on Cloud City. Close to death, Yoda also told Luke that there was another Skywalker, and it turned out to be Princess Leia. At the age of 900, Yoda died, becoming one with the Force along with Obi-Wan Kenobi and Anakin Skywalker. During the celebration on Endor after the second Death Star was destroyed, along with Emperor Palpatine, Luke saw the spirits of Obi-Wan, Yoda, and his now deceased but redeemed father Anakin Skywalker. In 2002, the Yoda minifigure became the first to be a noticeably different height due to the introduction of shorter legs. Since then, there have been a number of small minifigures, including the goblins, Professor Flitwick, Dobby from Harry Potter, Bart Simpson From The Simpsons, Ewoks, young Anakin Skywalker, young Boba Fett also from Star Wars, SpongeBob, and Short Round from the Indiana Jones sets. Yoda's original head is made of the same plastic (Acrylonitrile butadiene styrene) that is used for most parts. However, his most recent version has a rubber head. Yoda was voiced by Tom Kane for LEGO Star Wars: The Padawan Menace who voices Yoda in the 2003 Clone Wars and 2008 The Clone Wars TV series. 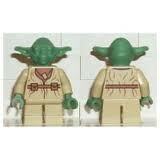 Yoda's minifigure is given tan legs, although, in the movies and on the Clone Wars TV series, he has brown pants. In 2013, Yoda's colour was changed to the new Olive Green, to represent his movie appearance. In Revenge of the Brick, Yoda very closely resembles his latest film variant even though Revenge of the Brick was made before the latest film variant. 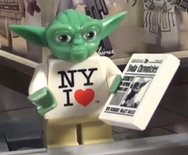 Yoda was featured on the boxes for the 2013 Star Wars sets. The 3947 Yoda Key Chain.